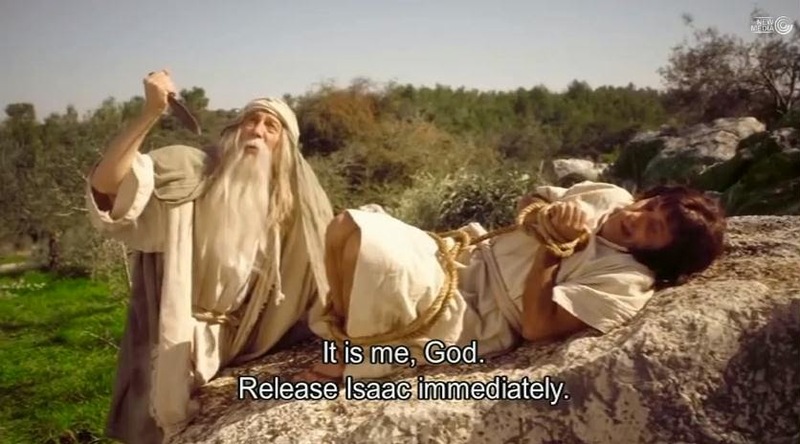 Jewish Humor Central: The Real Story of the Binding of Isaac - As Told by Satiric Israeli TV Show "The Jews are Coming"
The Real Story of the Binding of Isaac - As Told by Satiric Israeli TV Show "The Jews are Coming"
So you think you know the story of the binding of Isaac? Think again. The new (and controversial) satire now playing on TV sets in Israel, Hayehudim Ba'im (The Jews are Coming), has a different take on what went on behind the scenes. Just like all the other sketches in the series, it's funny and irreverent. Here's the episode in Hebrew with English subtitles so you can see what really went on when Abraham and Isaac journeyed to Mount Moriah to fulfill God's command to Abraham about offering his son Isaac as a sacrifice. We plan to bring you other episodes as soon as they are released with English subtitles. Please remember that this is satire, and clever satire at that. The writers are not being disrespectful, they are simply being funny. We find it to be well within the range of satire and parody that most Jews expect and accept on Purim. We're glad to have a taste of the fun of Purim all year long and applaud the creators of this series for finding humor in these situations. (A SPECIAL NOTE FOR NEW EMAIL SUBSCRIBERS: THE VIDEO MAY NOT BE VIEWABLE DIRECTLY FROM THE EMAIL THAT YOU GET EACH DAY ON SOME COMPUTERS AND TABLETS. YOU MUST CLICK ON THE TITLE AT THE TOP OF THE EMAIL TO REACH THE JEWISH HUMOR CENTRAL WEBSITE, FROM WHICH YOU CLICK ON THE PLAY BUTTON IN THE VIDEO IMAGE TO START THE VIDEO. Why didn't the translator write "BCE", instead of "BC"? If Jewish Mothers Wrote "Baby, It's Cold Outside"
Naomi Less Rocks Chanukah with "Eight Lights"
A Joke to Start the Week - "Sylvia's Going Deaf"
A Joke to Start the Week - "A Very Special Dog"
A Joke to Start the Week - "It's Chuck"